We all know that distance can be a problem getting the beers we want to try, so when my wife was heading to New England on a trip I was pretty excited. I got out my pen and paper and made a list. Topping that list was pretty much anything from Smuttynose. After having the pleasure of trying their Finestkind IPA I knew I wanted more from them. When my wife returned with Old Brown Dog I knew this would be good. 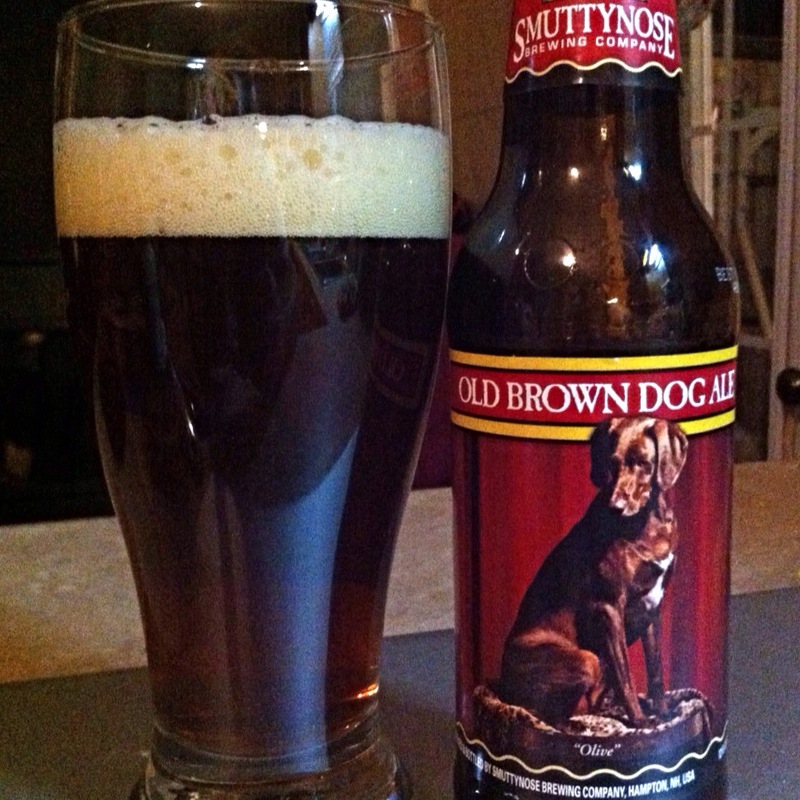 From the brewery: Old Brown Dog has been cited as a classic example of the “American Brown Ale” style of beer. Compared to a typical English Brown Ale, Old Brown Dog is fuller-bodied and more strongly hopped. Appearance: Deep golden brown with amber highlights. Off white, fluffy head. Clear. Aroma: Clean aroma for an ale. Grassy-grainy malt with some light flowery hop notes. Taste: Dark toasted bread with moderate bitterness. Little fruitiness – raisins, plum and hints of Toffee-like sweetness and slightly burnt sugar. There’s a little hops and is overall pretty balanced. Mouthfeel: Medium body. Medium-light carbonation. Pleasant on the palate. Overall: Very nice to drink. Not like the IPAs that I’ve had from Smuttynose, but shows their range of producing fantastic beers. Balanced and with a good hit of alcohol (6.7%) that is unlike the UK cousin beers, though you’d never notice in this one. Well done. You can find Smuttynose on the web, Facebook, Twitter, and Instagram. Recently, a friend visited the Craft Beer Cellar in Newton, Massachusetts and offered to bring me back some beer. At the top of my list was the Apricot au Poivre Saison (Reserve Series, Chardonnay Barrel Aged) by Nebraska Brewing Company. A multiple-award winner, this saison has garnered countless rave reviews, and I couldn’t wait to try it. My expectations were ridiculously high, and it surpassed them by a country mile. From the brewery: An artful interpretation of a Belgian-style Saison created with Apricot Puree and Black Pepper. Aged for 6 months in third-use French Oak Chardonnay barrels. Delicate flavours and aromas of oak, apricot, chardonnay, and pepper intertwined in the barrel to achieve a flavour profile that is simultaneously complex and delightful. Appearance: Like a golden sunrise in the glass, with a thin eggshell head that hangs on stubbornly. Tantalizing lacing. Aroma: Beautiful aroma of fresh baked bread, dried apricot and lemongrass. My mouth is watering. Taste: What a complex, well crafted beer. Apricot sweetness, nicely tamped down by a hit of black pepper. Slight vinous quality from the oak-barrel aging. Complex, but not too rich. Every mouthful is an experience. Mouthfeel: Light and lively, champagne carbonation. Overall: This is simply one of the best beers I’ve ever tasted. It’s big, it’s bold, it’s complex, it’s delicious. It’s the kind of beer that makes you want to run down the street high-fiving strangers. 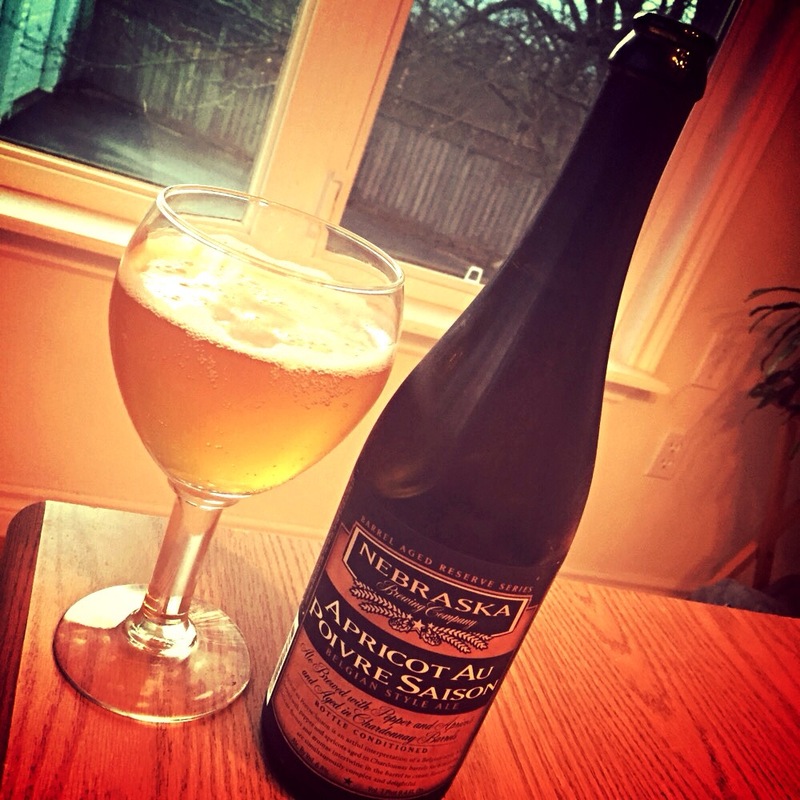 You can find Nebraska Brewing Company on the web, Facebook, Twitter, Instagram, and Untappd. With 15 years under its belt, Pump House Brewery & Restaurant in Moncton, New Brunswick is one of the originators of the East Coast craft brew scene. 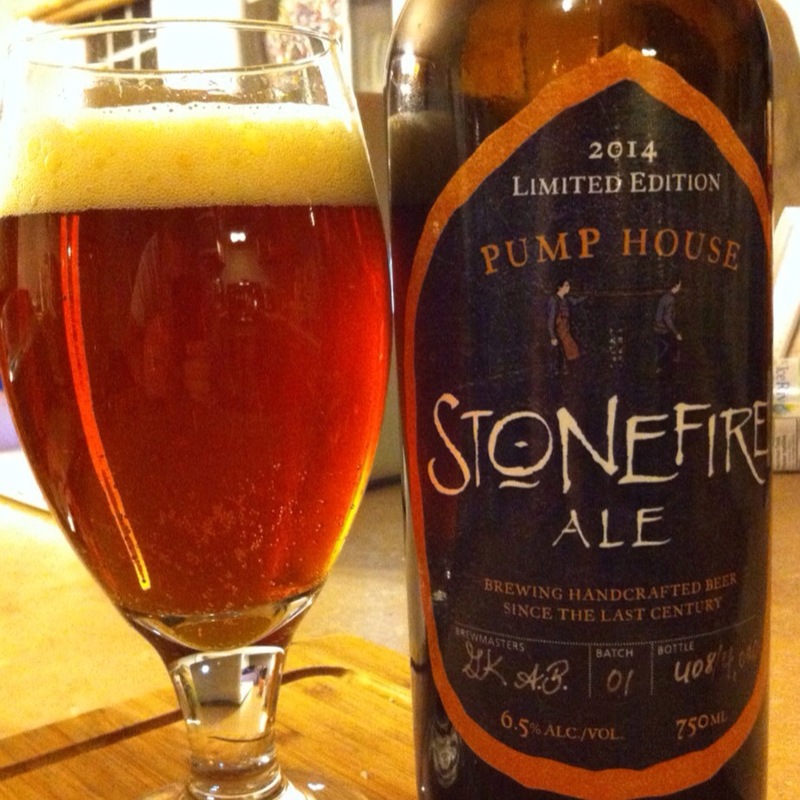 This fall, it marked its anniversary with its Stonefire Ale, in a limited release of just 4,000 750 millilitre bottles. Stonefire is a dark amber Steinbier—a traditional German technique in which brewers dunk red-hot stones into the wort to make it boil quickly. That caramelizes and burns the sugars, giving the beer a unique sweet profile. Matt and Trevor both sampled Stonefire lately, so we’re joining forces for a tag-team review. Matt’s bottle was 408 of the 4,000 produced, while Trevor had number 3,116. Appearance: We were struck by what an attractive pour this beer is. It has a rich burnt orange colour, and slight head, with lively carbonation. Aroma: Matt found it clean and malty, with slight grassy notes. Trevor, who seemed to get more head on his pour than Matt, was struck by a big unexpected nose of overripe oranges. Taste: We were both expecting this to be a heavy and rich beer, perhaps something like an Irish red. We were astonished when what we tasted was more like a saison than anything else. Matt found it light and refreshing, with a hint of spice and orange-zest bitterness to finish. Trevor also got a big orange hit, but found a bit of creaminess—“This tastes like a tart creamsicle.” Very slight malts to finish. Mouthfeel: With a light to medium body, this is a well carbonated beer. Trevor found it a touch fizzy; Matt didn’t. Overall: This was the first Steinbier either of us had tasted, so we can’t tell you how well it represents the style, but it sure wasn’t what we were expecting. When we compared tasting notes, we saw that we’d both used the word “saison” over and over. It’s a unique, nuanced beer, shockingly easy to drink, yet rich in flavour. Trevor found it paired well with spicy fried pepperoni. You can find Pump House Brewery on the web, Facebook, and Twitter.